I think my favorite studio container has to be the picnic silverware caddies I’ve picked up at thrift stores. As mentioned yesterday, I was able to get all my paint brushes, plus some pencils and even a pair of scissors, into a single caddy. My tool caddies - oh so handy! 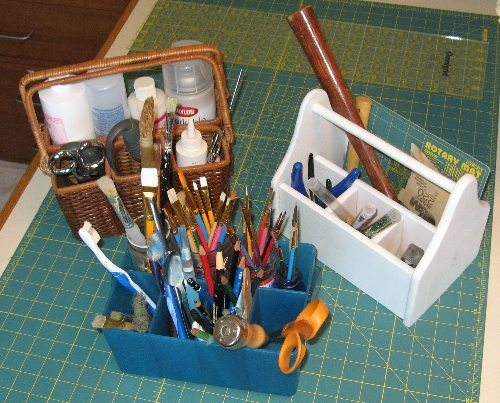 They can hold all sorts of things – scissors, pencils, brushes, awls, hammers, pliers, rotary cutters, small bottles – so I have one for each of my activity areas with the tools most commonly used in that area. They come in various materials and are easy to move around. Thanks to caddies, I can always find my scissors (which can be a trick when I sew and the fabric starts to pile up and drift all over the table). Thanks to the clean-up/organization I’ve done, I’ve spent time playing in my studio every day this week. Even brainless sewing (assembling quilt blocks into a quilt top) has been fun thanks to my stress-free creative environment. Of course, I’m not really done with the studio yet. I want to put up shelves to hold my finished projects and display inspiriational materials. I need to organize my closet. I can find things in there right now, but not all the storage is appropriate for what I have (ex: all my yarn is in one huge bin). My bead collection needs to be re-organized – everything has a container, but there’s no rhyme or reason to what is where. I also need to get better shelves and/or containers for my doll-making materials, which include a variety of strangely shaped bits and pieces. So there’s more to do, but I think I’ll wait until January before I tackle the next organizational task. I’d rather spend my time right now basking in the fun of a clean studio.